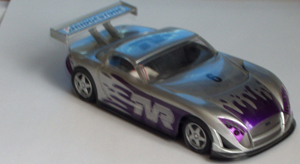 I found this model to have plenty of grip round the corners, much more than the TVR. Its top speed was also sufficient. This was my first model and i found it to be very forgiving. I would recommend one of these to a beginner. This model looks great and can take the knock (most of the time). The only think I managed to brake was on of its wing mirrors. this model didn't come with lights as it came out of a set but it was easy enough to retro fit them. 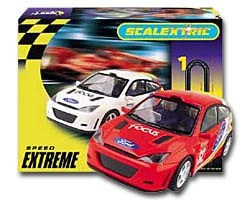 simply take out the rubber bung and put in the Scalextric replacement light. This model was faster than the focus but it had a lot less grip on the corners. for a beginner not the best car but once you get used to the power slides its a joy to drive. I often use this when I want to disadvantage myself when racing an inferior competitor to even it up a but. This model came with lights and has some nice driver detailing. The overall look of the car is a bit plasticy. This car also attracts dust like the plague.